How Bad Is the Flu Season in Every State? - 24/7 Wall St. This year’s flu season may still not have peaked and remains considerably worse than in recent years. 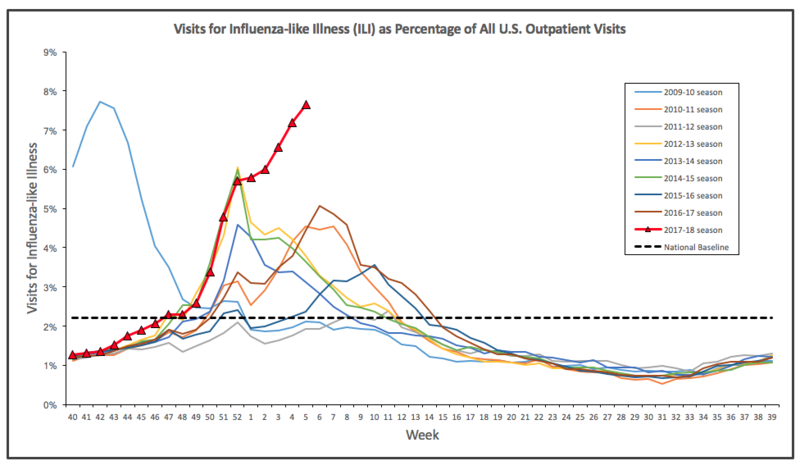 During the first week of February, 7.7% of doctor visits nationwide were for flu or flu-like illnesses, versus the off-season average of 2.2%. This is the highest level since the 2009 H1N1 pandemic. Fears of a flu pandemic emerged early in the United States after hospitalizations spiked at the start of this year’s flu season. The Atlanta-based agency said in a media advisory on Feb. 9 that the hospitalization rate for the fifth week of the 2017-2018 season is 59.9 per 100,000, above the corresponding period of 50.9 for the 2014-2015 season. The overall cumulative rate is approaching the overall end-of-season hospitalization rate of 64.2 for 2014-2015, the season with the highest final cumulative rate of laboratory-confirmed influenza hospitalizations. A flu pandemic can emerge anywhere and spread globally. The flu pandemic of 1918 killed as many as 100 million people — approximately 675,000 in the United States. Three flu pandemics have occurred since then, in 1957, 1968, and in 2009, when H1N1 (also known as the swine flu) killed approximately 12,469 Americans. The most prevalent strain of this year’s flu season has been identified as H3N2. In an email to 24/7 Wall St., spokesperson for the Centers for Disease Control and Prevention Ian Branam said, “H3N2-predominant seasons have been associated with more severe illness especially among people older than 65 years and children.” So far this flu season, children under the age of five, 50-64 year olds, and senior citizens are the most at risk groups. People 65 and older are over four times more likely to be hospitalized with the flu than the average American. While the current flu season is nowhere near 2009 levels, when flu cases spiked higher and earlier, the CDC is anticipating elevated influenza activity to continue for several more weeks. 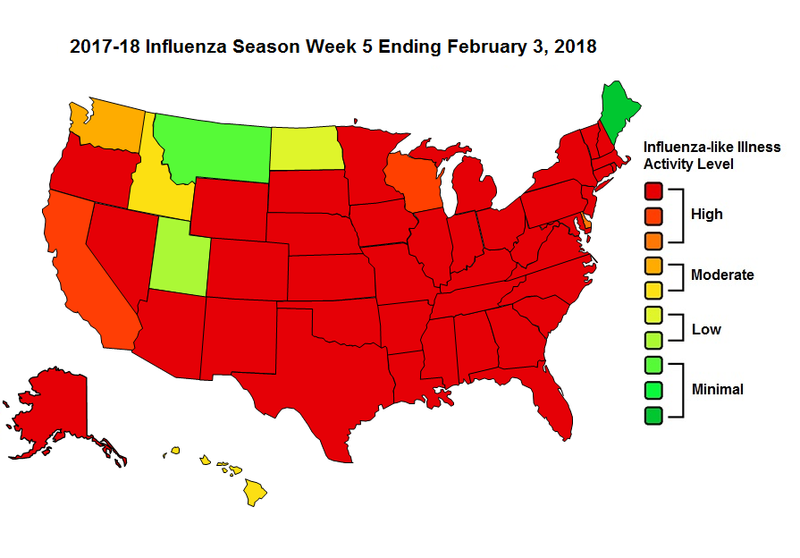 “This season is notable for the sheer volume of flu that is occurring in most of the country at the same time,” said Branam. 24/7 Wall St. reviewed influenza activity levels in every state using data from the influenza division of the CDC. Activity levels are as of the second week of January. Specifically, they measure the percentage of current outpatients reporting flu and flu-like illnesses compared to such reports over the past non-flu seasons. States with high activity levels are those where flu cases have exceeded the respective by the most. Click here to see the how bad the flu season is in every state.